Download "C A R L E T O N U N I V E R S I T Y POSITION DESCRIPTION OFFICER USE ONLY. 2. Position No: 298271"
3 learning outcomes assessment; must remain current on the province-wide quality assurance framework, guidelines and regulations, as well as related best practices. Knowledge of current university software applications, systems and databases and office software is required and must remain current. This is accomplished through regular participation in professional workshops, membership in professional associations, and seminars, together with the study of texts, journals and other materials relating to program-level learning outcomes assessment processes. Elaborate on (a) and (b) justifying the amount of each specified above by detailing what the incumbent has to know and what skills are required of the incumbent in the performance of the duties. Demonstrated knowledge of principles and practices of program assessment and evaluation; Experience in outcomes assessment and related activities within a higher education setting; Experience using qualitative and quantitative research methodologies; Awareness of challenges in fostering an institution-wide culture and commitment to assessment; Proven ability to coordinate and track multi-faceted, continuous processes; Ability to determine precise nature of information requests and to formulate a solution ; Ability to recommend and apply creative solutions to problems and issues; Strong comprehension and critical thinking to understand and advise on complex issues; Ability to monitor and track a multi-faceted and continuous process to meet timelines; Advanced communication skills written, verbal, comprehension; Strong organization skills and attention to detail; Strong capacity to problem solve, recognize need and develop plans for change; Exceptional level of judgment, initiative and reliability; Capacity to work under pressure and meet timelines; Superior interpersonal skills; Ability to work in a diverse, collegial, and consultative team environment; Ability to work independently with minimal supervision, demonstrate initiative and set priorities; Develop a solid understanding of the university environment. 2. 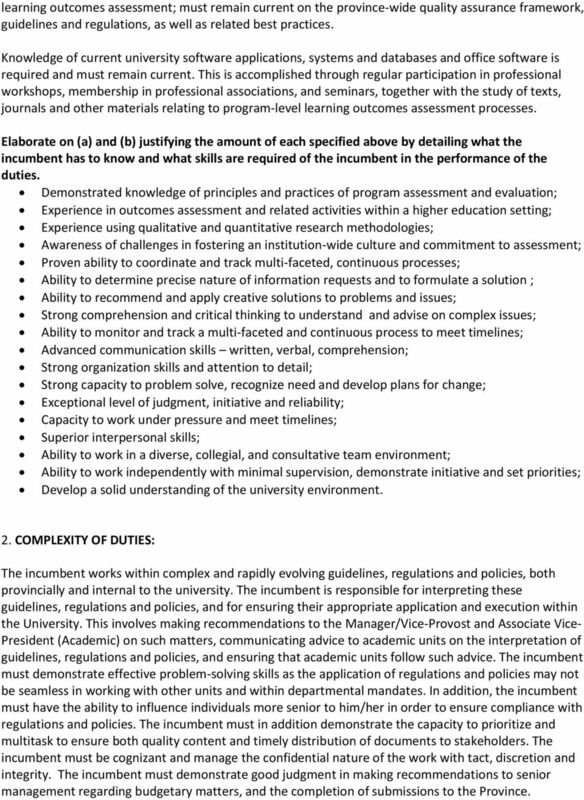 COMPLEXITY OF DUTIES: The incumbent works within complex and rapidly evolving guidelines, regulations and policies, both provincially and internal to the university. The incumbent is responsible for interpreting these guidelines, regulations and policies, and for ensuring their appropriate application and execution within the University. 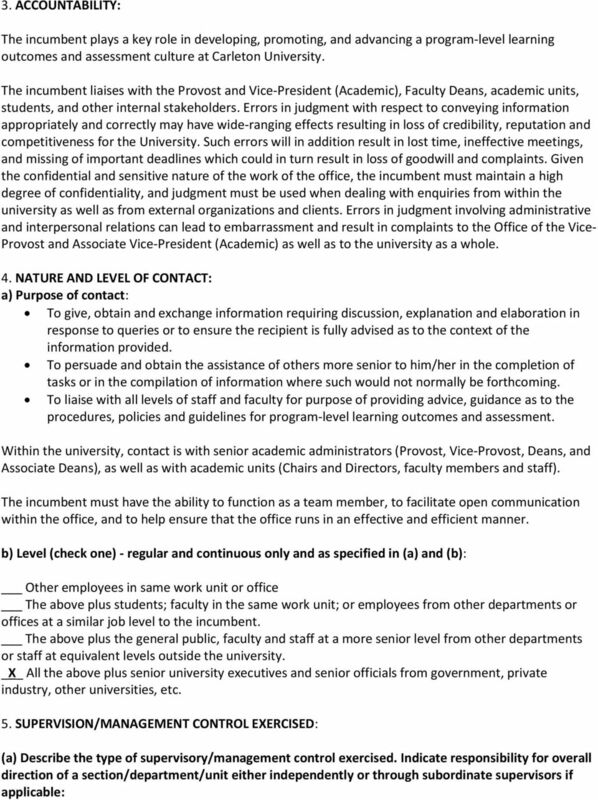 This involves making recommendations to the Manager/Vice-Provost and Associate Vice- President (Academic) on such matters, communicating advice to academic units on the interpretation of guidelines, regulations and policies, and ensuring that academic units follow such advice. The incumbent must demonstrate effective problem-solving skills as the application of regulations and policies may not be seamless in working with other units and within departmental mandates. In addition, the incumbent must have the ability to influence individuals more senior to him/her in order to ensure compliance with regulations and policies. The incumbent must in addition demonstrate the capacity to prioritize and multitask to ensure both quality content and timely distribution of documents to stakeholders. The incumbent must be cognizant and manage the confidential nature of the work with tact, discretion and integrity. The incumbent must demonstrate good judgment in making recommendations to senior management regarding budgetary matters, and the completion of submissions to the Province. The incumbent reports directly to the Director of Communications. 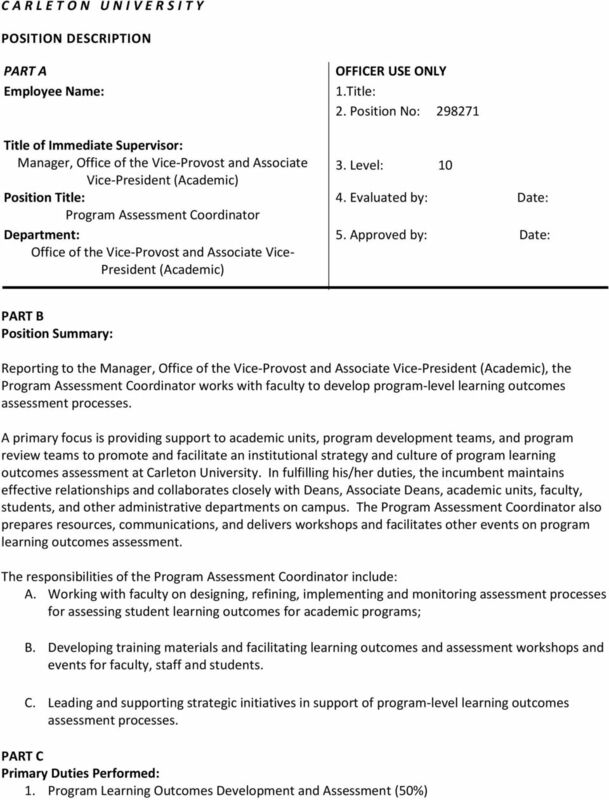 TITLING GUIDELINES Titling Guidelines create a standard format to ensure leadership titles are used consistently across the University and facilitates cross-university comparisons to advance pay equity. References to clients are references to the constituency members.